Rune Factory: A Fantasy Harvest Moon has been described by its producer as 'Harvest Moon where you wield a sword', which seems rather impractical for harvesting potatoes, but I'm no farmer so who knows. Best time with large-skip glitches: Single-segment 0:54:08 by Alex 'Anwonu' Morinaga on 2013-07-30. 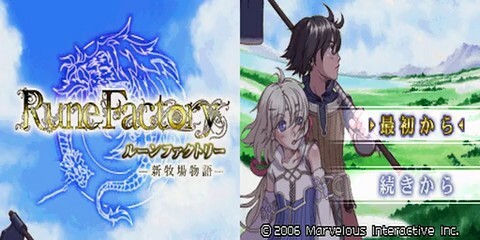 Rune Factory games are basically Harvest Moon with RPG elements. Speedrun-wise, the biggest difference is that RF has a main story, so it's easy to define the ending. In this game, there are 8 dungeons, each with its boss. However, by using a glitch, you just need to beat the first and the last ones. To be able to enter a dungeon, you need a permit from the mayor. Each one has a different requirement, but it's usually "beat last dungeon's boss" and/or "plow x squares in that dungeon". Greed Cave early: the biggest glitch. To do it, you need to tame a mount (earliest is a wolf in 2nd cave, that's why beating the 1st is necessary). By using it and pausing at the right moment while trying to enter the last dungeon, you can bypass the "no-permit wall". Invicibility/Invisibility: without this one, the run would actually get much harder. To do it, get hit by the fairy's attack while teleporting. Her attack makes me able to move again; and if I use the stairs before being teleported, I cancel it and become invincible, and either very small or completely invisible. By the way, they work in US version as well; J only has the text speed advantage. Some things for people who haven't played, or don't remember.